Many vehicles that are made into a street rod already have a VIN and a title. 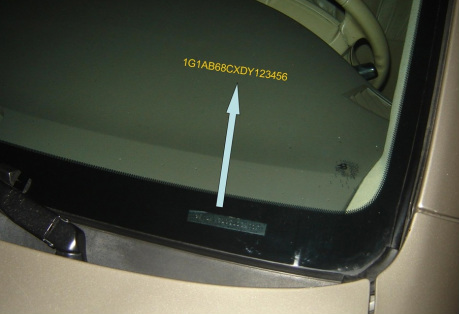 The vehicle identification number (or VIN) is needed to identify the exact type of vehicle being built or worked on. The VIN is also used for title and registration purposes. On most vehicles it is normally stamped on a metal tab that is fastened to the instrument panel close to the bottom of the windshield. See photo to the left. The VIN can be seen from the driver’s side of the car and is visible from the outside of the vehicle. Besides being found on the top of the dashboard, the VIN can also be found in other places. For example, depending upon the vehicle, year, and manufacturer, the VIN may be found on a label under the hood, in the driver’s side door jamb, on the glove box door, or the trunk lid to name a few other locations. Although most vehicles have a VIN, there are cases in which the VIN is not available. This occurs when a street rod enthusiast decides to build an older vehicle, and the VIN is not available. This could also happen if the vehicle is being built from scratch or if the VIN has been lost or removed years ago. In either case, it is important to get a VIN. Without it, the vehicle cannot be titled, and therefore cannot be licensed. Please keep in mind that each State’s procedure will be different. Depending upon the State in which the street rod is to be titled and licensed, the following steps may be necessary to complete this process. Keep in mind that the following steps may occur in a different order as well as the amount of time to complete. · One of the first steps is to review the procedures necessary to get the VIN, title, and license by contacting the State’s Driver and Vehicle Services Division or similar office. This can be done by contacting the State’s Motor Vehicle Department or the Department of Transportation. · Some States require an initial inspection to make sure the vehicle does not have a VIN. This often occurs at a various vehicle inspection locations around the State. Since you can’t drive the vehicle without a vehicle license, this will require you to transport the vehicle on a trailer. · During this first inspection, it may be necessary to produce a complete inventory of all major parts and labor incurred since the construction of the street rod began. So it is a good idea to keep detailed records of all major purchases, the costs, part numbers and other ID numbers (if available), and the date of purchase. Also, keep a good inventory of photos taken during construction. · After passing the initial inspection, the forms and paperwork are generally submitted by the inspection office, back to the necessary State office. · At this particular point, the State should issue a VIN for your street rod. Some States may require that you return to the inspection office and have the VIN installed on the vehicle at that location. Again, the vehicle may have to be transported on a trailer to complete this process if necessary. In this case, the VIN is often installed on the door jamb.
. The next step is to apply for a title to the street rod. Again, this process will vary with the particular State in which the title is to be issued. Some States will require you to purchase a Surety Bond for a specific value of the vehicle, and a specific length of time. A Surety Bond is an insurance policy that protects the State from any possible losses due to any previous vehicle or parts theft. For example, the bond might be issued for three years and for a value of $60,000. Keep in mind that you may not be able to get a title for the street rod until you have the necessary Surety Bond. Not all insurance companies will sell you a Surety Bond. So it’s a good idea to check with your insurance company at this time. Also, remember, this Surety Bond is not insurance on your street rod for you, it’s for the State. · If all is in order, the State should issue a title for the street rod, with a note on the title that it is secured by a Surety Bond for three years from the date of filing. · After getting the title, a temporary license can often be obtained for 60 days to allow you to drive the vehicle. However, you need to make certain that your street rod is insured properly. If your insurance company will not insure your street rod until it has a title and license, you may have to go to another insurance company that specializes in street rod insurance. In fact, there are companies that will insure your street rod project from the beginning of the process and allow you to change the value of insurance as more costs are incurred. · Once a title has been issued for your street rod, the next step is to apply for a license. Depending upon your State, your local licensing office should be able to issue a license. Talk with this office to get help in obtaining a specific name for your license if needed.